“Days before his release from prison, Shadow’s wife, Laura, dies in a mysterious car crash. Numbly, he makes his way back home. On the plane, he encounters the enigmatic Mr Wednesday, who claims to be a refugee from a distant war, a former god and the king of America. While this book has an overall 4.11 stars on Goodreads and has won many awards, I just couldn’t quite get into it. I did finish it but with reluctance and the thought I could be doing something else with my time. Shadow is released from prison and follows Wednesday around America doing odd-jobs and trying to keep out of trouble. The people and gods he meets along the way are so interesting and full of character. The old golds from mythology around the world are banding together to fight the modern gods of Media and Money etc. Shadow is pulled into the middle of it all, so much more so than he originally thought he would. Throw in some coin tricks, a ghost-like wife, a town full of secrets and some creepy happenings and you have yourself a novel of epic proportions. The whole thing sounded magical and my type of book – I love mythology and road trips and even the idea of old and new gods battling it out intrigued me. Buuut it just didn’t do it for me and I hate that it didn’t. Despite all these awesome aspects being pulled together, I feel like there were way too many interruptions to the story, as it sort of leaped from following Shadow to other people throughout. It could have been cut down easily by 100 pages or so, and perhaps the size is part of the reason I didn’t enjoy it as much as I feel I should have. 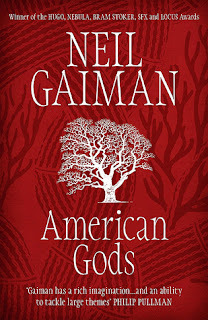 My copy was 722 pages, although that included a novella and an interview with Neil Gaiman. The story is still a whopping 600ish pages, and that’s way too long in my books (pun intended?). However! I pulled it up from 1 star to 2 stars because a) the characters were awesome, b) I loved the concept and c) I can see that it was a good book, it just wasn't for me. American Gods has been recently made into a show, which was one of the reasons I read the book. I think I’ll enjoy the show more (*gasp! * Can you say that? On a book blog?!). If you have read the book and seen the show, what did you think? Do you think the adaptation was a good one, and true to the story? If you’ve seen the show but not read the book – did you enjoy it? And if you’ve read the book, do you plan on watching the series?